The Under 9’s added another trophy to their collection by capturing the Mary Pratt Memorial shield last Saturday morning in Lismore. Here we played Araglin in the first match which saw our boys get into their stride quickly and run out easy winners. William Beresford was hugely impressive throughout the day with Rian Walsh in outstanding form in a centre forward position scoring a brace of points, (heres hoping that his uncle Shane will be just as impressive next week in the Munster Final) Meanwhile, Maurice Shanahan kept a close eye on proceedings as he was the referee on the day. The second match against Castlelyons was a much tougher and closer affair, which saw us only a point ahead at half time. The defence held out in the second half with a great defensive performance coming from all the backs, most notably from Kevin Keohan, Donnacha O’Dwyer and Oisin O’Riordan. Up front, the forwards were finding their targets with David Byrne and John Joe Queally fresh after their south of France training and Adam Carroll Lawlor notching up the scores to impressive effect. The Abbeyside boys running out comfortable winners in the end. The final match was against the home team Lismore and a win here would see us secure the title. Here, Sean Lanigan was making his presence felt in midfield, with Adam Barry burrowing holes in the Lismore defence assisted by some solid defensive work being done by Sean Og Flynn and Mark Sheehan. Seanie Lenihan commanded the goal and made a great save in the second half and played well when called to do so. Up front Joe Flynn was battling hard and helping the attack keeping the scoreboard ticking over. Lismore as you would expect made it difficult with every ball keenly contested. But it was to be Abbeyside’s day which saw them notch up the scores and run out comfortable winners in the end. Well done to all the boys on three splendid team performances which saw us bring the shield back to Village. Many thanks to Lismore GAA club for inviting us to this tournament and to the O’Rourke family for presenting the perpetual trophy. Gerry O’Rourke, on behalf of the O’Rourke family presented the trophy to Oisin O’Riordan, Captain and the winners medals to the Abbeyside team. Mary Pratt (nee O’Rourke) died in 2006 at a young age and had a close association with Lismore GAA club. Thanks to the parents who travelled and supported the team and again thanks to Lismore for the Tea, coffee and sandwiches and goodie bags for the players. Panel on the day was as follows: Rian Walsh, Seanie Lenihan, William Beresford, Kevin Keohan, Donnacha O’Dwyer, Oisin O’Riordan, David Byrne, John Joe Queally, Adam Carroll Lawlor, Sean Lanigan, Adam Barry, Sean Og Flynn, Mark Sheehan, Joe Flynn. Training Wednesday evenings at 6.00pm – 7.30pm and Friday evening training from 6.00pm to 7.30pm.Teamers will be sent out for each session. Parents are asked to reply to the teamers after each text as each team are only allowed a certain number of free teamer texts. 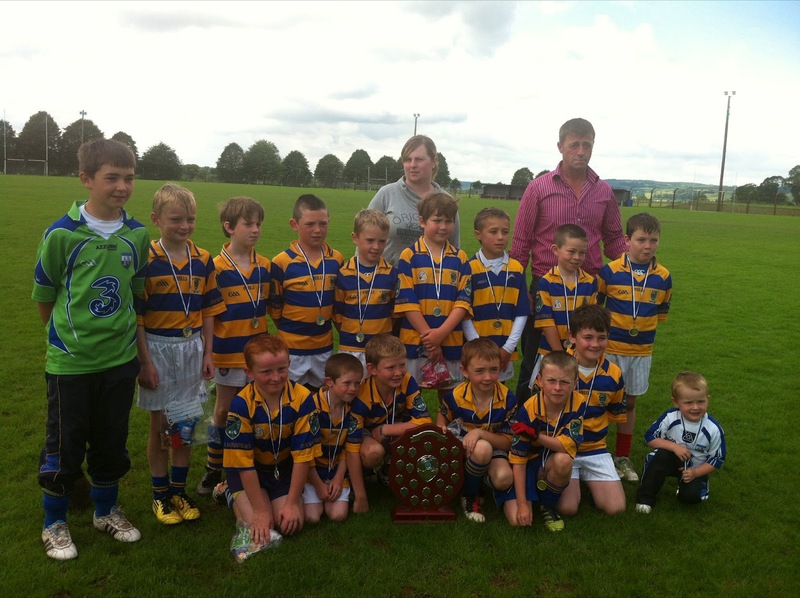 Our under 11’s travelled to Tallow last Saturday to play in the C&GD Gala day, where we played Dungarvan, Cois Bhrid and Killeagh. This was played in splendid weather conditions and our boys played very well in all 3 games. Panel: Eoin Ahearne, Senan Travers, Cian O’Riordan, Oisin Hallahan, Ethan Raher, David Hayes, Darragh Slevin, David Kiely, Colin Foley, Niall Buckley, Sean Sullivan, Ronan Foley, Tadhg Collins, Ben O’Donovan, Daniel Treen, Michael Troy, David Kiely. Next outing here is Blitz next Saturday in Ardmore. We played Dungarvan and Kilrossanty last week in both divisions of the under 13 hurling Western championship. These games were played in terrible weather conditions but we managed to win both Games. Panel: Aaron Beresford, Mark Towmey, Shane Ahearne, Jack Kiely, Tommy Walsh, Padraig Moore, Tom Looby, Sean Crotty, Gearoid Hallinan, Bearach Moore, Shane Kiely, David Montgomery, Jamie Walsh, John Power, James Riordan. Cian Power, Meldan Dwyer, Jack Dwane, Johnny Treen, Sean Kent, Eoin Ahearne, Dean Beresford, Fion Gibson Kiely, Cian Riordan, Michael Troy, Ethan Raher, Senan Travers, Michael Kiely. Our last games in this part of the Championship is away to Cois Bhrid and Ballyduff upper on Monday 16th. Our under 16 hurlers begin their county championship on Wednesday night, the 11th of July at home to Sacred Heart. The game throws in at 7.30 pm. Our Minor hurlers played their first game in the county championship against Passage last Friday in a rain soaked Abbeyside. This was a tough game in less than ideal conditions. The lads never took their foot of the pedal in the entire 60 minutes and came away with a well deserved win. Full time score: Abbeyside 3-8 Passage 1-4. The cul camp took place in our club grounds last week.A great week was had by all who attended and the sun even managed to shine on most days. Our flag day took place over last weekend. The response by volunteers was poor but well done to the boys who did volunteer; your efforts are much appreciated.